The clay fired brick has been the most popular building material in India for centuries, but its production has hugely negative environmental and social impacts — the pollution produced by dirty brick kilns, the use of valuable top-soil, and the poor working conditions. Now, the Eco BLAC brick, produced by a group of MIT students, could offer an environmentally and economically sustainable solution: the brick is made from recycled industrial waste and doesn’t require firing at all. 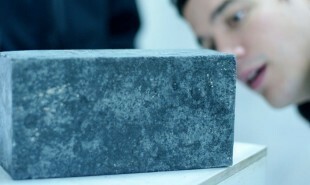 The Eco BLAC brick will be made from 70 percent boiler ash — a byproduct of combustion created at small and medium factories — mixed with sodium hydroxide, lime and a small amount of clay. Boiler ash is currently disposed of in harmful ways, such as in local landfills. Whereas normal bricks require a huge amount of energy in order to be fired at 1,000 degrees celsius, the Eco BLAC brick doesn’t need firing. Instead, it uses alkali-activation technology which enables the bricks to set at an ambient temperature. The Eco BLAC brick is currently being tested in Muzaffarnager in partnership with a local paper mill. How else could waste products be recycled and replace valuable raw materials?